We have well over 200 volunteers who contribute countless hours to CU Maurice River. In fact, well over 10,000 hours are accumulated each year. There are so many ways to get involved and our needs are so very diverse. We have habitat projects in which folks do trail work, make nesting boxes, plant trees, put up osprey platforms, and the like. Gardeners get involved in many ways, too: planting trees, native gardens, and educating others about the hazards of exotic plants. Knowledgeable naturalists help people to appreciate nature on walks. 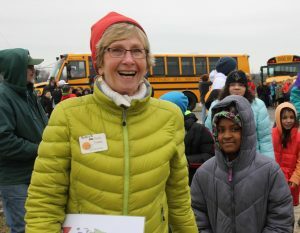 Many retired teachers find their niche in our youth programs such as Wild About Cumberland, YMCA Camp Merrywood’s Connect with Nature, Elevate, Pledge to Fledge, and at festivals where they turn hundreds of kids on to nature. We also have a group of trained Ambassadors who represent CU at numerous festivals. Citizen scientists collect biota samples for contaminant-testing to learn more about the health of our waterways. Many members observe wildlife for various state projects like the State’s eagle recovery program. Folks who like to cook help prepare meals for the Shorebird Recovery Team for the month of May, or help with our fundraisers such as the Chili Bowl. Artistically-talented members get involved in countless ways: they lead CU-Paint-A-Landscape, help with graphics, donate fine crafts to our annual auction, and we even have an art scholarship. There are hardly any skills that we don’t at one time or another need, be it teachers, builders, architects, landscapers, biologists, ornithologists, entomologists, nurses, business leaders, proof readers, writers, GIS specialists, cartographers, bankers, investors, designers, orators, hunters, trappers, skippers, boaters – you name it, there will at some point be a need. We are a community of interesting people and our interests intersect continually. In today’s microchip-driven world, people have become more and more disconnected from nature. CU Maurice River continues to work hard to maintain natural connections and bridge that ever-widening gap. And it seems like, at least some of the time, we succeed. It is our volunteers who do the colossal effort of making these wondrous connections for the community. Ultimately, it enriches the lives of our volunteers and those we serve. We have well over 200 volunteers who contribute countless hours to CU Maurice River. In fact, well over 10,000 hours are accumulated each year. Listed here are some who coordinate or interact with our members on a regular basis. Allen was raised in Chepachet, Rhode Island by two nature-loving parents, Lake and Marie Jackson. After graduating from the University of New Hampshire and serving in the US Air Force, Allen Jackson worked for the US Environmental Protection Agency for two years and at US Fish & Wildlife Massachusetts for four years. He then spent 20+ years at US Fish & Wildlife New Jersey Field Office before retiring. In this position he dealt with endangered species, wetland protection, contamination issues, and habitat restoration. Since retirement in 2002, Allen has been pursuing his many passions in the environmental field. He is a purple martin landlord mentor and manager. He also has a master banding permit for both purple martins and bluebirds. His efforts with CU Maurice River members and local organizations have created the largest-known martin colony east of the Rockies. He also fostered the founding of the NJ Bluebird Society where he currently serves as the organization’s president. He also manages over 500 bluebird boxes in southern NJ. He has worked with federal facilities, environmental organizations, military bases, and interested individuals on avian habitat restoration projects. He mentors local teachers to foster an appreciation of the out-of-doors in students. His undertakings do not stop there. Allen dedicates a vast amount of his time to volunteering for environmental conservation and appreciation projects. When awarding Allen with the Landlord of the Year Award in 2002, The Purple Martin Conservation Association (PMCA) lovingly referred to Allen as a “Johnny Appleseed type,” a man who plants preservation ideas rather than seeds. 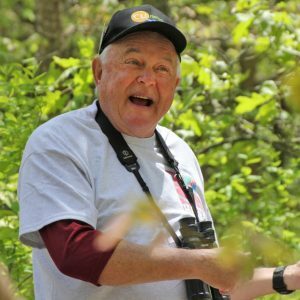 While active with many different environment, education, and community organizations, Allen Jackson averages 900+ volunteer hours a year at CU Maurice River alone. 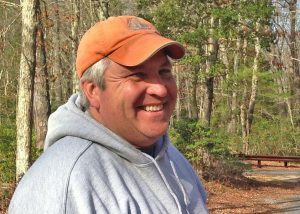 His bestowing of thousands of hours per year to the protection of New Jersey’s natural resources has earned him a Lifetime Presidential Volunteer Service Award. As CU Maurice River’s Wildlife and Habitat Manager, Allen coordinates the management of bluebird trails, mentors members on purple martin landlord practices, constructs wood duck boxes, takes the helm on wildlife and habitat restoration projects, monitors bald eagle nests, and shares his knowledge and love for nature with CU Maurice River as well as the local community. Allen is also CU Maurice River’s resident expert on mutual dependency of some bird species, and is the head naturalist for activities such as the Purple Martin Spectacular. Bringing profound knowledge, experience, and professionalism with him, CU Maurice River’s members continually benefit from Allen’s devotion to the organization’s mission. Allen is not only an excellent mentor on wildlife management, but he is also a family man. In 1995 he married Billie and gained a family of 6 children and 5 grandchildren. In his free time Allen enjoys spending time with them, travelling and bicycling. Mary Watkins – Retired Registered Nurse with a BA in Music Education who also serves on the CU Board of Trustees. 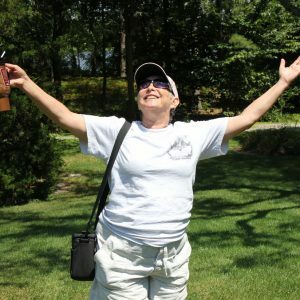 She considers herself a “rabid birder” and has attended several seminars on bird I.D., behavior, song I.D. and migration. Mary volunteers for CU as a Chili Bowl chef and auction committee, guides nature walks, and participates annually in Wild About Cumberland as a trail leader. 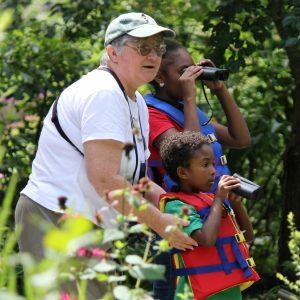 She also volunteers as an assistant trip leader with Cape May Bird Observatory, and participates in annual citizen science research including Cornell Feederwatch, Cumberland Christmas Bird Count, and raptor and black rail surveys. Mary captains CU’S World Series of Birding team, the Fish Hawks. Christine Brown – Walk leader and superior volunteer. Has been a long-time devotee of nature. She is especially gifted in botany, but takes an interest in all that nature provides. Her other-side-of-the-pond accent delivers a kind of Attenborough flavor to her descriptions. Sharpen your ears for her unanticipated wry wit, and prepare for a good walk. 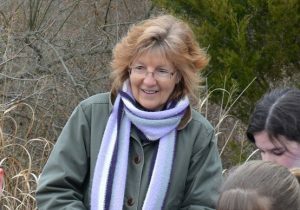 Wendy Walker – Walk leader and superior volunteer. Queen of the self-deprecating remark, Wendy is in fact very observant and brings a quirky enthusiasm to our walks. She especially fancies birds. Be on the lookout for emails titled WWW@”SITENAME” for information on impromptu walks with Wendy & Company. Our volunteer naturalists often like to organize impromptu outings based on weather reports and enthusiasm. Think of it as being similar to a neighborhood game of stickball when you were younger. 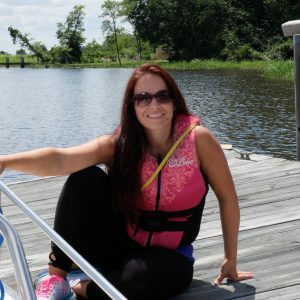 Caitlin B. Mazowski, RN – Visiting Crafts Coordinator. Katie is a nurse by profession, but along with raising her two young daughters she has been utilizing two of her main interests: working with geriatric residents and art therapy. A number of residents who had formerly stayed confined to their room have ventured out to enjoy sessions with Caitlin. When school is out Caitlin’s young daughter Sophia helps out. In fact Sophia was known, at 8 years of age, to work rings around some of our more mature volunteers in keeping CU Paint-A-Landscape fully supplied. We are grateful to a capable group of amateur and professional photographers who have donated pictures to us for a vast array of uses: presentations, the website, brochures, educational materials, and simply remembering or documenting things we have done.